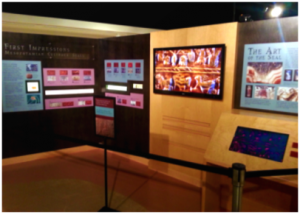 The redesign of the The Land between Two Rivers exhibit includes artifacts not displayed since the World Heritage Museum and the new exhibit area First Impressions: Mesopotamian Cylinder Seals, featuring our first digital multimedia interactive. The exhibit builds on groundbreaking technology in artifact imaging being done at the Museum. Visitors and guests at the opening were invited to explore the displays, enjoy refreshments, and listen to the talk ""Mini-masterpieces: the Art of the Mesopotamian Cylinder Seal"" by curator and museum director Wayne Pitard. eDream & AVL multimedia specialist, Jeff Carpenter, presented an overview of how he brought these artifacts to life in creating the interactive exhibit. AVL/eDream team member Jeff Carpenter created the interactive application for the recent redesign of the The Land between Two Rivers exhibit at the Spurlock Museum on the University of Illinois campus. The exhibit includes artifacts not displayed since before the World Heritage Museum moved to the new location. The interactive kiosk contains images and scenes from the various artifacts in the exhibit. Using Photoshop, After Effects and Flash, Carpenter was able to bring the various scenes of gods, monsters and animals to life. Enabling the user to explore the various scenes and characters present on these ancient seals. 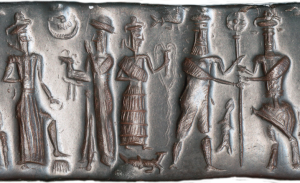 The cylinder seal exhibit was made possible in part by a grant from the University of Illinois’ Office of the Vice Chancellor for Public Engagement.